As with most homeowner choices, choosing a new freestanding bathtub can be quite a daunting task.But a freestanding bathtub offers your bathroom a unique feel that the alternatives don’t compare to. Freestanding bathtubs have a unique design and come in a wide variety of flexible options and fit into almost any budget. Choosing the right bathtub can make your bathroom a quiet oasis of comfort and security so let us begin. Freedom of choice is a wonderful thing. With a freestanding bathtub, you are allowed the freedom to create any size bathtub that fits your preference. Whether you want a classic clawfoot or a more modern sleek design, the choice is yours. Freestanding tubs have a unique look that is sustained through the quality of the material used in their making, which additionally gives your bath space a luxurious feel unlike any other. Similar to installation, placement means you can actively dictate where your tub is located. Since there are no walls you need to install adjacent to, freestanding tubs allow you the freedom to creatively furnish your bathroom your way. Freedom of choice does come with a little bump as freestanding tubs are generally more expensive than built-in tubs even with installation costs. Freestanding tubs are also a bit on the heavy side, so only install them on a reinforced floor that can sustain the additional weight. Keep in mind that they are also larger in size which means they will carry much more water weight in addition to their normal heftiness, so plan accordingly. Common or standard dimensions for a freestanding bathtub are 60 inches long (5ft), 30 inches wide (2.5ft) with 19 inches of water depth (1.89ft). Small freestanding bathtubs can run 55 inches long(4.58ft), 27 inches wide (2.25ft) with a water depth of 15(1.25ft). Large freestanding tubs begin at around 72 inches long (6ft), 32 inches wide (2.67ft) with 20 inches of water depth (1.6ft). Though keep in mind that style will largely affect your overall size. Small bathtubs to medium bathtubs tend to be the more popular choice as they take up less space and are much easier to climb in and out of. The larger size, while elegant and luxurious in aesthetic, may be difficult for small children and elderly to use. For a more detailed look into dimensions & sizes read this article: Standard bathtub dimensions and sizes for every type of tub. Common materials for freestanding bathtubs include cast stone, acrylic, cast iron, fiberglass and stone resin. Each carries their own distinct advantages and disadvantages, so research thoroughly before purchasing. Stone Resin bathtubs are made from a blend of acrylic polymer and natural minerals-usually resin. Stone resin retains heat longer for much longer than average bathtubs, which means your water will be kept warmer for longer periods of time, which means long soak times. Stone resin is able to sustain heavy punishment without fear of damage. The material is also non-porous, meaning it will not absorb water and crack over time, lending further to it’s incredible longevity. Stone resin is easy to maintain and clean, as most stains and mildew will wash away with simple warm water while lightly abrasive substances can be used for more stubborn residues. Con: Higher quality, but more expensive. Compared to other bathtubs on the market, it may seem on the pricier end of the spectrum, but Stone Resin bathtubs are a quality investment long term for your bath space. Cast stone is made by combining cement with pigments and crushed natural stone to give the cement mixture a more natural look. Generally accepted as a replacement for sandstone, limestone, coral rock, granite, slate and other natural stones. Cast stone has a wide variety of options, since the material is man made. As such, color and style is flexible and ultimately up to you, allowing you the freedom to pair your bathtub with whatever you wish. Compared to most bathtubs on the market currently, cast stone is very affordable. Affordability also allows for more options in customizing your bath space. Since the material is man made, it may not appear as original or authentic compared to natural stone. It may also discolor quite heavily with repeated use over time. As the material comes in a wide variety of natural stone options, it tends to be less durable compared to other materials on the market largely dependent on the quality of the stone selected, also the material is porous, leading to cracking over time. Acrylic bathtubs are made by taking a solid sheet of petrochemicals, stabilizers, resins, fillers, and dye which are then heated and molded into a bathtub shape before being reinforced with fiberglass. Acrylic bathtubs are non-porous, meaning they will not absorb water. As a result, the material will not crack as easily compared to other bathtub materials like fiberglass. Acrylic bathtubs does a poor job of retaining heat. Which means your water will not stay warm long. While Acrylic tubs are more durable compared to fiberglass, it is quite pricey when compared to other similarly durable tubs on the market. Also, do keep in mind that if any damages occur down the line, you are looking to replace the entire bathtub, which drives the cost that much higher. Cast iron bathtubs are made by pouring molten iron into a bathtub mold then smoothed over and covered in a layer of protective enamel. Cast Iron bathtubs are perhaps the most durable tubs on the market. Able to weather high impacts, the material is also highly resistant to scratching or chipping as well. Cast iron bathtubs are extraordinarily easy to clean, as warm water and baking soda will typically do the trick. Of course abrasive cleaners can also be used without damaging the bathtub. Cast Iron retains heat longer than average bathtubs, which means your water will be kept warmer for longer periods of time, which means long soak times. While Cast iron may be highly durable, the material also tends to be quite heavy. Please make sure your floor can support the additional weight of the bathtub, especially when it is full. 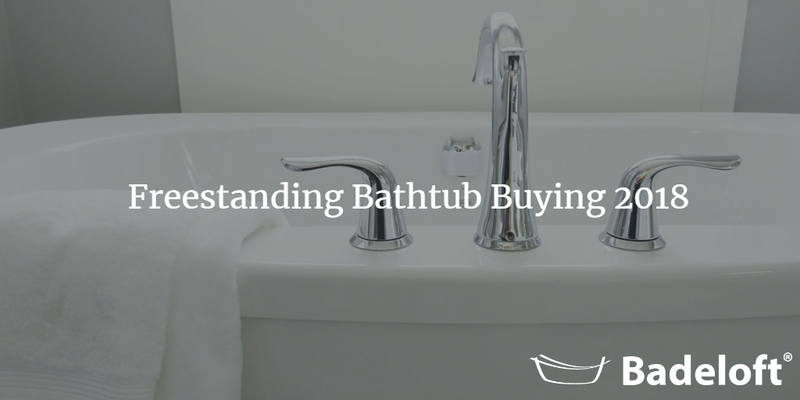 While there are many positives to owning a cast iron bathtub, it may well be beyond your current budget as they ring around $1000 starting, so research accordingly. Fiberglass bathtubs are made by reinforced plastic which is then formed into layers, molded into a bathtub shape before coated with a layer of gelcoat resin. is a kind of reinforced plastic which is formed into layers then molded into a bathtub shape before being coated with a layer of gelcoat resin. Fiberglass Bathtubs are perhaps the cheapest on the market. With a starting price tag of around $200, you can easily construct your bath space within an easy budget. Fiberglass is incredibly lightweight, making self or DIY installation a breeze. This also is beneficial when it comes to replacing this sort of bathtub down the road due to any damages that may occur. Fiberglass also happens to be quite cheap in its construction. The material cannot survive any heavy or sustained impacts and will most certainly chip easily as a result. Fiberglass will ‘flex’ over time, causing it to warp and feel unstable over time, creating rivets and pockets. The material is also porous, meaning it will absorb water, which combined with natural flexing will lead to cracks in the material. Bathtubs come in many different styles, but the most common ones seen today are more of a Modern feel, a Round design or your classic Clawfoot. The more modern and classic approach is very similar, allowing you to fully lay down and soak while still providing standing space for the option of a shower. The round design is more suited for just soaking and for much smaller homes that cannot accommodate the former. For those who want a sleek, modern design, there is a wide range of tubs that will suit your needs. Oval tubs are the most common, though any number of shapes can be designed and tailored to your needs if you choose. Generally, this style of tub sits somewhere between Round and Clawfoot, with a heavy emphasis on flexibility. For those in a more confined space, round bathtubs are seen as a great solution. Typically tucked into the far corner, these are the ideal bathtubs for long soaks as they submerge your body up to your shoulders and have an integrated seat built into them. A more traditional bathtub as they have been around since the 1800’s and still remain a popular style today. Typically found in both single and double ended, single-slipper and double-slipper designs, they come in a wide variety of designs and fit any home looking for a more classic feel for their bathtub. With faucets, you have two options: floor mount and wall mount. Both come in both single handle and double handle variants and will come down to personal preference as the functionality is similar. A floor mounted faucet usually installed on the lip or backside of your bathtub. Easy to install, merely fasten the end you wish to the top of your bathtub and make sure it is anchored to the floor. Temperature and flow are controlled by one handle. A floor mounted faucet installed on the lip or backside of your bathtub. Easy to install, merely fasten the end you wish to the top of your bathtub and make sure it is anchored to the floor. Hot and Cold water is handled by turning the handles in a singular direction. Aesthetically pleasing, but might take some getting used to. Coming in both single and double handle variants, wall mounted faucets are installed through the wall. While it may be aesthetically more pleasing in your bath space, wall mounts typically require reworking some of your plumbing and are more of a hassle to install, so plan accordingly. There are a wide array of faucet styles, the more popular being telephone, Victorian, modern and English. Choosing a faucet is more dependent on personal preference as their functionality is very similar. A faucet style made popular in the 1950’s, telephone faucets are shaped similarly to an old telephone set. The faucet rests on two cradle arms, which u can easily remove for your washing needs. An older style faucet unique to bathtubs from the mid 1800’s. These are likely to be long and sloped at the top, similar to an elephant trunk and is usually operated with two handles. Modern faucets have a more reserved design that is much more compact, but still retains much of their function as well. Instead of the water flowing in one continuous stream, the flow is fanned out, allowing for a more even spread of water and less dangerous to small children. Modern faucets are most popular in smaller homes. English style faucets are similar to Victorian faucets, but are a tad bit shorter and are usually made of nickel or bronze. These are generally not as popular as telephone, Victorian or modern styles. Faucet materials can also come in many different forms, but the common ones you are most likely going to find are bronze, chrome, and nickel. Ultimately the material you choose will depend on the color scheme of your bath space and which fixtures you already have present. Bronze or oil rubbed bronze, is a chemically darkened finish that is meant to simulate aged bronze. Bronze carries a good finish, allowing you to pair easily with a large variety of bathtub styles. As such, the material also comes in a wide variety of styles, allowing you freedom in selecting what is appropriate for your bath space. This material pairs well with more rustic or classical looking aesthetics. Bronze is also durable, meaning the luster of your finish will not fade easily or discolor through heavy water usage. It is also quite easy to maintain and polish, simply rub it down with water every once in a while to maintain the finish. While bronze has many positives, the finish is also the most expensive when compared to Nickel and Chrome, so check your budget. Chrome has a smooth and shiny finish, pairing well with most bath spaces where you want your fixtures to stand out. For a bright luster, chrome is also inexpensive when compared to other faucet materials on the market, meaning it can fit easily into almost any budget bath space with ease. While durable, Chrome will also show fingerprints and water spots over time, unfortunately. Regular maintenance should be kept to remove any smudges that will dirty the finish. A polished nickel finish is nickel plating over brass which is then fully polished. Polished nickel has a warmer tone compared to other materials like chrome. The polished nature of the material will add an extra degree of warmth to any bath space. This material pairs well with more modern finishes and aesthetics, generally colder or lighter colors. Polished nickel is incredibly durable, able to withstand heavy punishment without scratching or damaging the finish. While it is more vibrant aesthetically, polished nickel is also on the higher end of price when compared to other materials. Polished nickel will require constant maintenance to keep the finish, otherwise it will tarnish. Like Chrome, this material will also show fingerprints and water spots, so be rigorous in cleaning it. Can a modern freestanding bathtub also be a shower? Yes, a modern freestanding bathtub can be a shower provided you make some small adjustments. First, there is a wide range of shower heads for any height available, in addition, you can install curtains and mount them, creating a shower. Freestanding bathtubs start at around $1200-2900. Depending on the quality and material that the tub is made of, the material can greatly influence the cost. Spending more on quality materials, like stone resin, can be a better long term investment because of the longer lasting nature of the material. Installing a freestanding bathtub is a relatively easy process and requires only a few steps depending on your current plumbing set up. For a detailed overview of how to install your free standing bathtub visit this article: How to install a freestanding bathtub. What are freestanding bathtubs made of? How do I secure a freestanding bathtub to the floor? In short, you don’t. Most freestanding bathtubs are quite heavy and its weight will keep it tethered to your floor. If you have concerns or doubts, you can use some DIY fastens to make it more secure in your bath space, but generally they are not needed. How many people can a freestanding bathtub fit? How far should the distance be between freestanding tub and wall? The distance between your tub and wall should be between 15-18 inches or at least 1 foot. Can freestanding tubs come with jets? Yes, a freestanding tub can come with jets, Japanese style tubs come with pressurized jets for comfort, but of course, these must be custom ordered and may not be easy to install. There are actually quite a few positives when comparing freestanding bathtubs to built-ins. Built-ins are more affordable, meaning you have an easier time fitting them into your budget. Plumbing is also easier as many homes already support built-ins and they are quite easy to clean and replace down the road. However, built-ins also lack flexibility with space and installation as they must always be flush with walls to install. Lack of flexibility also extends to the style and material selection as you have fewer options when you choose a built-in or drop-in bathtub. And lastly, they are on the whole less appealing aesthetically as they offer no real unique flair to your bath experience. Freestanding bathtubs on the other hand, offer a wide variety of choice when it comes to style, overall design, and materials used. You are allowed a much wider degree of freedom when selecting your material as well as placement in your space. They have a unique look and feel that built-in tubs can’t even compare to. Plus, they are quite easy to clean and maintain due to many of the popular materials used in their construction, and although they are more pricey compared to drop-in tubs, many are now quite affordable nowadays. Also, check if your floor can support the additional weight as freestanding bathtubs are much heavier than built-ins. Ultimately, the right freestanding bathtub for you is the one that fits your bathroom. They offer a modern and versatile design that simply can’t be beat compared to any other bathtubs on the market. Just remember that the right bathtub is the one that makes you the most comfortable because after all, you are the one using it. Why do you recommend a distance of 1 foot minimum from fixed walls to the free standing tub? why can’t I be closer like 6 inches on one side?? I have limitation to my space. Although 1 foot is recommended (for cleaning the bathtub) 6 inches is still enough space.